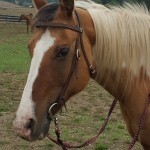 Gideon is 15 and was rescued from the kill pen in southern Washington. Gideon competes in local events such as team (cow) sorting and gymkhanas. He represents DHF in these events. Occasionally Gideon will take children on lead line rides on Saturday as well. Hope was donated to DHF this past year. 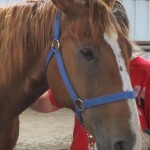 She is 15 years old and was a former lead trail horse that hadn’t been ridden in 5 to 6 years when she came to DHF. Hope quickly found her place at the ranch and has been a great addition. She competes in the gymkhanas with the Advanced Group. 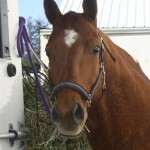 Faith came to DHF as a rescue horse. 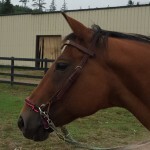 Bonnie made a trip to a well-known kill pen in southern Washington on DHF’s behalf. There she picked up 4 horses, saving them from slaughter. 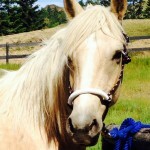 Faith was an untrained 4 year old at the time, but has since blossomed into a great addition to the ranch. Faith competes in the gymkhanas with the Advanced Group. Belle came to DHF as a rescue from the kill pen. She is 10 years old. Belle enjoys the hill country, but will also perform in the arenas. She tends to do best with more advanced riders. Belle competes in the gymkhanas with the Advanced Group. Dandy is a 12 years old that has been a favorite for many children. She is a beautiful buckskin dun. Although she has periodic troubles with stiffness, she still helps with the Saturday Group.